It’s sort of been good-days-and-bad-days around here lately. Good days, like what I wrote about in a recent post, and bad days, like what I don’t write about. I allude to Nigel’s “grumpiness,” which is blog-speak for blatant disrespectfulness; I say that he is doing well emotionally and behaviorally, and days later he is raging and crying about being irresponsible and worthless; I write about him being comfortable at his current school, yet his academic/executive functioning skills are still lacking (putting it mildly), and I have no strength to deal with it now, after years of dealing with it alone. I need a vacation. We need a vacation. Fortunately, several months ago we started planning a vacation for the week of Thanksgiving. My father is an avid world traveler and wanted to take his two older grandsons on an international trip as their high school graduation gift from him. Not sure what direction his cancer battle would take (he is currently undergoing his third round of treatment), earlier this year Dad suggested that we accompany him on his annual Thanksgiving-in-Thailand trip now rather than wait for their graduations. And so, I am very excited to announce that early Friday morning we leave for a week in Thailand! The boys are ecstatic about their first international trip – they have read and enjoyed National Geographic since Kindergarten and can’t wait to get out and explore and experience (albeit briefly) another country. Grandpa has planned some amazing activities! And it will be so great to spend some time together. We can’t wait! This entry was posted in Awards, Misc. Thoughts and tagged Awards, favorites on November 16, 2010 by Tanya Savko. From time to time I receive e-mails from readers asking how I’m doing, often about things that don’t necessarily pertain to this blog, which is totally fine. Here, I write mostly about my experiences raising my two boys, one of whom has autism. I don’t go into much personal stuff because I think of this blog as a resource for other parents. But then I realized that when I read other blogs, one of the things I truly enjoy is a post on a more personal level. I feel like I get to know the blogger a little better, identify with him or her, and often learn something new. And since I usually enjoy reading the personal bits, I figured that some of my readers might like that too. So, in that vein, I’ve decided to occasionally write some personal posts to address those “touching base” e-mails that I receive. For example, I am often asked how my writing is coming along, especially since I’ve been threatening to publish a book for over a year now. Well, as with everything else in my life that doesn’t have to do with work and raising kids, it’s coming along slowly. I’m close, though! Really close! I just have a few more things to iron out, and then it’s off to the printer! I had considered having another editor look at it, but I gave it some careful consideration and think that I just need to bite the bullet and get it out there. It’s time (almost). Really? You’re hitting on a single mom of two kids, and you think a line like that is gonna get you anywhere? I was so shocked that I couldn’t even say anything. My friend, however, had a few choice words to say, including, “How sad for your kids” as we turned on our heels and walked out. I mean, it’s not like I’m expecting to meet a great guy in a pub. I wasn’t expecting to meet anyone that night, nor was I wanting to. I just wanted to go out and kick back with my friend. Instead, we meet a jerk who’s been a single dad for three years and thinks he’s going to impress me by complaining about it and insulting good parents everywhere. Next! In other news, I recently received the Friendly Blogger award from my friend Nicki at Slow Down, Gym Shoe. Nicki was a recipient of the Lemonade award that I passed on to her for her positive outlook. Thanks for this cool award, Nicki! This entry was posted in Awards, Misc. Thoughts and tagged Awards, Dating, writing on November 8, 2009 by Tanya Savko. I was born and raised in Los Angeles County. I decided at the age of four that I wanted to be a writer. I was a writer for Halloween when I was eight years old. I received my BA in English. I graduated from college, got married, and gave birth to my first child all in the same year. I have always loved tigers. I am planning to go to Thailand next year with my father and my sons. Meg at The Pages of Our Crazy Life for her creative photo pages. Cathy at The Clothesline for her recipes, photos, and haiku. Michelle at The Sneathen Family Site for her creative approach to problem-solving. Dynamite Girl for her creative story-telling. Joanie at The Bright Side for her recipes, decorating ideas, and art recommendations. Yours, Mine and Autism for the most creative blog name about a blended family. Alicia at Welcome to My Planet for her cool, creative header, which I love, along with the rest of her blog! This entry was posted in Milestones and tagged Awards on September 13, 2009 by Tanya Savko. –Kia of Good Enough Mama, because I don’t think she has this award yet! This entry was posted in Awards and tagged Awards on January 25, 2009 by Tanya Savko. 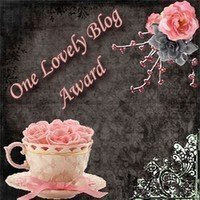 Yay – I’ve received another blog award, and it’s a pretty one! Faces of Autism, Casdok’s inspired new blog showcasing some beautiful people, including Nigel! This entry was posted in Awards and tagged Awards on October 16, 2008 by Tanya Savko.